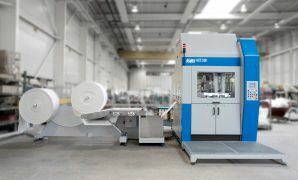 With VMI’s ACE 400 cotton pad punching and packaging machine you can produce up to 20 million cotton bags per year, with just one operator. The fully automatic ACE 400 can replace up to four manual systems, considerably reducing labor costs. The system is completely enclosed to reduce noise to minimal levels (<80 dB), increase safety and reduce dust. The design of the system is based on decades of experience in cotton pad punching and packaging and focuses on easy and economical operation. The machine is easy to set up and can be commissioned in just a few days. With the ACE 400, you will only require four hours to switch between a wide variety of cotton pad shapes. Furthermore, it is easy to relocate the machine, so you can set-up and start-up without delay. The ACE 400 will produce and pack cotton pads of round, square or oval shapes. The ACE 400 replaces up to four manual systems and two machines can be operated by one operator. 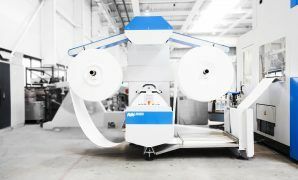 The ACE 400 processes a cotton web up to a width of 400 millimeters. Depending on the amount of cotton pads in one bag, it can fill up to 56 bags per minute. Moreover the ACE 400 is developed to be the most flexible installation of the total ACE range. Change over from one pad shape to another is only a matter of changing the pads shape related parts.